Mario Balotelli is expected to complete his £16m move to Liverpool on Monday. The striker, 24, flew to Merseyside for a medical on Friday and will be back after the weekend to conclude the formalities of a transfer that will see him earn nearly £120,000 a week. The deal will not be done in time for the Italian to make his debut against former club Manchester City on Monday. Liverpool are understood to have sought assurances from Balotelli about his commitment and off-field behaviour. Balotelli joins Manchester City in August 2010 for £24m from Inter Milan. He scores 30 goals in 80 games and helps the club win their first Premier League title. He struggles with discipline at City and is involved in a training-ground altercation with then-manager Roberto Mancini, prompting his departure. AC Milan sign Balotelli from City in January 2013 for £19m, and the striker goes on to score 30 goals in 54 games. Having impressed for Italy during Euro 2012, scoring twice in the semi-finals, he nets the winner against England in the group stages at the 2014 Fifa World Cup in Brazil. Balotelli is a controversial figure both on and off the pitch, but Liverpool boss Brendan Rodgers insists that any player he signs will not be a disruptive influence. He said: "We have quite an extensive code of conduct for players and staff. There is no specific one for any one individual. "This isn't like many clubs. Liverpool is a club that is a real strong family football club, with values and ethics that run over many years. "I, as the manager, will fight to protect that always, so no matter which players or professionals are at the club, they will abide by that. "But we understand that sometimes you have to take a risk with people. And a lot of the time, if you take that risk you can get a reward for it." There had been suggestions Samuel Eto'o was on standby to sign for Liverpool should Balotelli fail his medical. But whilst the Cameroon forward was an option Rodgers was seriously considering at one stage, Balotelli is now the only option. But he was also in the headlines for several off-the-pitch incidents - including a training-ground row with then-manager Roberto Mancini. 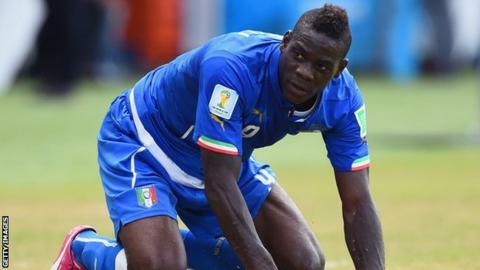 Former Liverpool defender Gary Gillespie believes the signing of Balotelli is a big risk for his former side. "His reputation does go before him," he told BBC Radio 5 live. "Brendan Rodgers, out of all the young managers today, would probably be the one to handle him better than most, but I do still think it's a big gamble."